6 November 2018, The U.S. Electronic Design Automation Software (EDA) Market is expected to reach USD 4.25 Billion by 2025. The growth is majorly driven by the noticeable growth of electronics industry in the U.S. Rapid product development in the electronics market is expected to increase the demand for EDA software?s as these are used in designing of circuits and IC designing. The consumer electronics market in the U.S. is expected to grow at a steady growth rate by virtue of an increase in the demand for consumer electronics in the region. Growing demand from electronic component manufacturers is expected to drive the demand for EDA software over the forecast period. The emergence of SoC technology in the majority of electronics has been a major driving factor for the U.S. electronic design automation software market. The on-premises application of EDA software?s is expected to grow at a rapid pace as on-premises software?s provide data execution across many functions, product lines, and business units. The emergence of virtual reality, 3D smart televisions, wireless communication systems as well as smart home appliances, the demand for designing of circuits has increased. These factors are expected to have a direct impact on the growth of the market. EDA involves a unique set of software algorithms which are essential for designing of complex semiconductor and next-generation products. With an increase in VLSI design, EDA also becomes complicated. EDA software?s are majorly used by electronic equipment manufacturers. Majorly the products include televisions, DVD and multimedia players, video recorders, Wi-Fi adapters, smartphone components, and many more. Dynamic nature of the consumer electronics market is expected to increase the demand for electronic design automation software over the forecast period. The trend of continuous product development showcased by the consumer electronics market has led in a very active R&D department which is involved in designing of components for new and latest products. 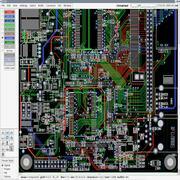 This process uses EDA software for circuit and IC designing. Additionally, rapid penetration of Internet of Things (IoT) is expected to drive the demand for EDA software?s as these new products require designing from scratch. Increasing usage of internet will help EDA developers to provide software?s and services through online portals. Such strategies are expected to improve market penetration for new players in the market. Provision of online portals will help the players to reduce capital expenditure, infrastructure costs, improvement in the supply chain, and cost of ownership which will, in turn, improve profit margins for the providers. The design software is expected to emerge as a lucrative segment on account of its heavy usage across all industries. Usage of design software?s is done across all product developments where circuits are involved. Circuits act as a basis for connections and EDA software?s are used to design those circuits. The microprocessor & microcontroller segment is expected to show noticeable growth pertaining to demand for microprocessors & microcontrollers in the majority of electronics used on a day to day basis. Rapid penetration of latest technology and trends in the U.S. makes it a potential marketplace. Key players in the U.S. electronic design automation market comprise of Cadence Design Systems, Synopsys, Inc., Mentor Graphics, ZUKEN INC., Silvaco, Inc. and many more players. Manufacturers are concentrating on providing highly accurate software with updates over the period of usage. The market is largely controlled by well-established players even though the share of small players is noticeable too. Manufacturers are concentrating on providing cost-effective tools and solutions to the end users in order to capture the untapped market.